A true 21st century creative visionary and founder of two of the most talked about companies in the world, Tesla Motors and SpaceX, Elon Musk has changed the way we perceive the world and beyond, as he leads us in revolutionising transportation both on Earth and in space. Ranked by Forbes as the 25th most powerful man in the world this year, it’s important to look back on Musk’s journey to success, and it’s safe to say it has been far from plain sailing for this innovator. In fact, some of Musk’s failures have been so catastrophic than just one of them could have been the end of his career or even himself entirely, and it’s likely to have been the end of many of us if we were in his shoes. 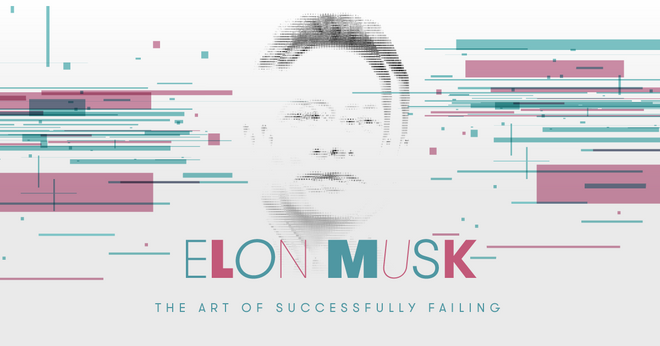 From being ousted as CEO of his own company, failed rocket launches, getting fired whilst on honeymoon, contracting malaria and surviving a major car crash, Musk has been so close to losing everything on many occasions we have to commend him for the art of successfully failing, as each and every time he has come back stronger to become one of the wealthiest people on this planet. Impressed? This timeline reveals a whopping 16 failures Musk has experienced since 1995 on his journey to tech fame. That’s nearly an obstacle every year, and at least one every other year. With Tesla Motors revenue reaching $11.8 billion in 2017 and SpaceX valued at more than $20 billion, this businessman has done remarkably well considering the challenges he has faced along the way. We’ve all faced a job rejection at some point in our careers and Musk was no different back in 1995 when he was starting out. Musk applied for a job at Netscape, despite not having a background in computer science and unfortunately didn’t land it. Interestingly, Musk even went to the head office to follow up on his application, however was too shy to speak to anyone. Constantly spoken about in the news and known for his ambitious predictions in space, this forward thinker has come a long way over the past two decades. A year later and Musk faced another blow in 1996, and this one was personal. Setting up your own company is an amazing achievement and that is what Musk and his brother had done in the mid-nineties with Zip2, a business which provided city guide software. After founding your own company you wouldn’t expect to lose your job, right? Wrong, for Musk at least as he was ousted as CEO by the board of directors due to a belief he did not have the operational skill set of a CEO. Moving to the position of Chairman, it wasn’t all bad news for this entrepreneur as he held onto his shares which later made him $22 million. In 2018, PayPal is known for being one of the largest companies in the world. But it wasn’t always this way. In 1999 when the company was founded by Musk and called X.com, the first product launch was voted one of the top 10 worst business ideas. Nearly 20 years on and Musk turned this failure and the business around entirely, successfully mastering that embarrassing moment in the early stages of the company’s existence. The new millenium didn’t give Musk much more luck. PayPal ousted him as CEO in 2000, the same year he contracted malaria, which took him over 6 months to recover. But after selling PayPal in 2002 to eBay, Musk had a lot of money to spend on his new project; space exploration and rocket technology. But with this new avenue came a lot of explosive failures, quite literally. Between 2006 and 2008 Musk faced three rocket explosions, with some failing just two minutes after launching. Not only did these failures see years of development and money go down the drain, but also made for uncomfortable situations as the third rocket explosion had NASA satellites on board. Musk’s rockets didn’t improve as the next decade continued, facing two more rocket explosions in 2015 and 2016. Founded in 2003, Tesla Motors has been on a bumpy ride to the success and respect it receives as a global business today. In 2008 Tesla and SpaceX were both on the verge of bankruptcy. It really wasn’t a great year for Musk, for his career and personal life, as he was also going through divorce. A few years on and another disaster struck for this automotive company. Back in 2014, three of Tesla’s Model S cars self combusted in six weeks due to a fault with the battery. Tesla’s failures didn’t stop there, with the most recent taking place just a few months ago. In March 2018, Tesla recalled 123,000 Model S vehicles due to an issue with the power steering components. Shares of Tesla dropped nearly 4% in after-hours trade. Despite these colossal mistakes that could have brought the company under for good, Musk has managed to bring it back every time and maintain a good image for the company as it continues to be known as the world’s most famous automotive and energy brand, that has a value of an impressive $650 billion. Looking back on the past two decades, you could say Musk has experienced bigger failures than he has successes in some ways, and it’s likely he will experience more in the future. But despite these setbacks, it is worth commending this visionary for bouncing back and making a success out of each and every one of them. Well done, Musk.